His approach to Lucha Libre was by his father and his brother. He did not have a formal trainer in professional wrestling. He could be considered self-taught. He learned lucha libre first and then he learned amateur wrestling, olympic and greco-roman while attending middle school. He was trained by Leonel Perez and Cristobal Flaga. His lucha libre training was for 15 years training in Arena Huracan Ramirez and Arena Coliseo Mexicali, while his amateur preparation was for 7 years. He also trained MMA for a year. He was formerly known as Osiris, nevertheless he decided to change his name since he learned that were multiple wrestlers using that name or spin-offs. He based on the movie of Gladiator to choose his new name and character. 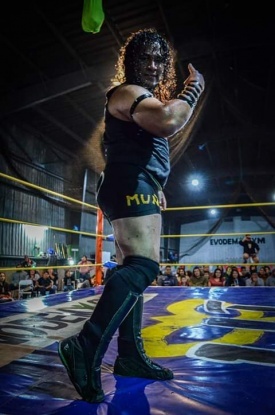 Wrestled in all over Baja California with promotions such as Empresa Arena Nacionalista, RLI, LPF, Reyna Promotions, EAW, Promociones Cholo de Tijuana, LLT, Promociones Maxilar, 126f Promotions, ER, Baja Cross, Promociones Mora, Evolución, and The Crash. Had presentations in Baja California Sur with Baja Sur; in Sonora with Promociones Pendragon Rojo and Nogales Lucha Libre. He also had participated with Chilanga Mask. This page was last edited on 21 November 2018, at 00:36.